Paper marbling is a method of 'aqueous surface design, using ink in water, creating a marble like effect'. This is then transferred to paper or an absorbent fabric to create stunning designs. It has a close association with the art of bookbinding and calligraphy as it is often used as a writing surface or book covers. The idea is, that with a lot of skill and concentration involved, it creates fantastic and bold monotype decorations. No two are the same, that is what makes paper marbling such a distinct and special form of art. Paper marbling is essentially a type of printing. Similiar to block printing, you use ink and various tools to create a design but instead of using a stamp, you use water. Freya Scott from Paperwilds informs us a little more on the history of paper marbling. 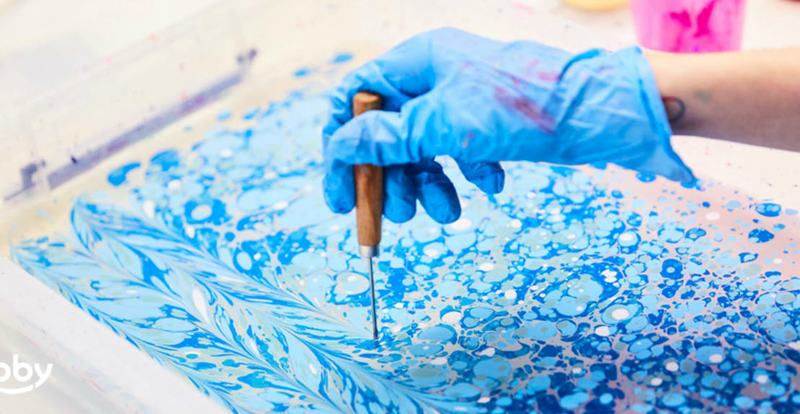 Freya is one of the last practising artists of paper marbling in the UK. In 2016, The Heritage Crafts Association marked paper-marbling as being extinct. "Paper marbling is an artistic method of creating patterns by floating pigments on an aqueous substance. These patterns are then transferred to paper, fabric or other material by laying it directly onto the surface of the water. The art probably originated in Japan, with the earliest examples of ‘suminagashi’ dating to around the 12th century. This type of marbling used ink on the water to create delicate patterns. The art eventually found its way along the trade routes and into Turkey, where the art was further developed and named ‘ebru’, which roughly translates as ‘cloud art’. The Ottoman Empire first used marbling to prevent forgery on their legal documents, but eventually, it became an art form in its own right. Instead of water and the pale inks and concentric circles of the Japanese marbling, Turkish marbling used a thickened water and brighter pigments. Various tools were used to create bright and intricate patterns. From the 15th century onwards, the technique of marbling made its way from Turkey and all the way across Europe. Many of the traditional patterns have a name or flavour of the country they were invented in; the Italian marblers were known for their intricate patterns such as the peacock, whereas the French preferred to draw curls into their papers using a stylus. Marbling has long been associated with bookbinding, with many bookbinders in the 18th and 19th centuries having a specific marbler who would produce patterns particular to that bindery. For a long time, the specifics of how to produce patterns was largely passed from master to apprentice. Many books on the subject explained the patterns and tools but not how to create the beautiful papers themselves. It wasn’t until Charles Woolnough wrote a book in 1853 that the real secrets of the art were revealed. The technique, which can appear very easy at first glance, is actually an intricate process, and it takes a great deal of patience and skill to fine-tune all the variables at each stage. Today the art has been revived, and practitioners come from all over the world, though in Britain there are few professional marblers, and the craft is now listed as endangered."